The 100 Club is a music venue in London situated at 100 Oxford Street, W1, originally called The Feldman Swing Club. The 100 Club attained legendary status in modern British music, having played host to live music since 24 October 1942. In 2009 Feldman's Swing Club was named by the Brecon Jazz Festival as one of 12 venues which had made the most important contributions to jazz music in the United Kingdom, for its contributions in the 1942-1954 period. 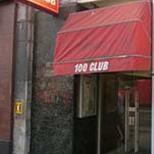 In September 2010, it was announced that the 100 Club would close at the end of 2010 owing to continuing losses. A campaign was launched to keep the venue open, supported by musicians including Paul McCartney, and in February 2011 a partnership with Nike subsidiary Converse was arranged, enabling the 100 Club to remain open. Venue Rules - Current England & Wales Licensing laws are strictly enforced - Ticket holder may be subject to search - Tickets are non-refundable or transferable - The venue reserves the right to change the bill without prior notification. - Ticket holders consent to any filming and sound recordings as members of the audience - Ticket holders may be subject to continuous sound levels which may cause potential damage to hearing - Ticket holders may be exposed to strobe lights - Only official merchandise is on sale inside the venue, do not buy outside. This is for your protection so that you will receive goods of proven quality. - No 'professional' type cameras, video cameras or sound recording equipment will be allowed in the venue. - No re-admission policy is strictly enforced - No bottles, cans, alcohol or food is to be brought into the venue - No illegal substances may be brought into or taken on the premises. Any one caught in possession of such substances will be ejected form the premises and may be reported to the Police - Any ticket holder throwing objects (beer, glasses etc) will be removed from the building and no refund given. Furthermore, customer details will be provided to the regulatory authorities should an offence be alleged to have taken place. - The venue management accepts no responsibility for acts of willful endangerment, or injuries caused thereby to yourself or other patrons whilst on the premises. - No weapons. The management reserve the right to define & confiscate - No smoking anywhere within the venue complex - at it's discretion the venue management will allow smokers out of the venue. Management reserves right to refuse admission The Venue adopts a neighbour friendly policy so please make as little noise as possible on leaving the venue. The closest tube is Tottenham Court Road (Northern line Charing Cross branch & Central line) - exit station by Oxford Street West, Northside steps - the venue is 250 metres along Oxford Street. Oxford Street tube (Victoria, Central & Bakerloo lines) is also close - exit station by Oxford Street East, Northside steps - the venue is 500 metres along Oxford Street. You are advised to use public transport as roads in central London are congested & there is little on-street parking in the roads around the venue. Black Cabs occupy Oxford Street & there is a mini cab office on Wardour Street (opposite venue) including Liberty Cars/Airport Cars. Do not use drivers touting for business outside the venue - they will be unlicensed & illegal. Bus routes that stop directly outside the Club are: 7, 8, 25, 55, 98, 176 and N8, N25, N176, N207 Buses that stop 30 metres away are: 10, 73, N73. If you have to drive there are 2 pay car parks between Wells Mews & Berners Street (200 metres) & on Tottenham Court Road/Great Russell St adjacent to the YMCA (600 metres). Call the venue on 020 7636 0933 to arrange requirements.